Not a position you can normally stand in! Viewed from the middle of the closed M5 motorway (with permission) on the night of 12 February 1994, the new 360 tonne bridge has just been postioned next to the existing Hallen railway bridge. This was to take the new double track on the Hallen Marsh Junction to Filton freight line. Note the flat area in the foreground where the central barriers have been removed in order to allow the new span to be swung round from the southbound carriageway (on the right). Engineers are now checking the position of the structure before lowering the deck onto the abutments and removing the multi-wheeled trailers. 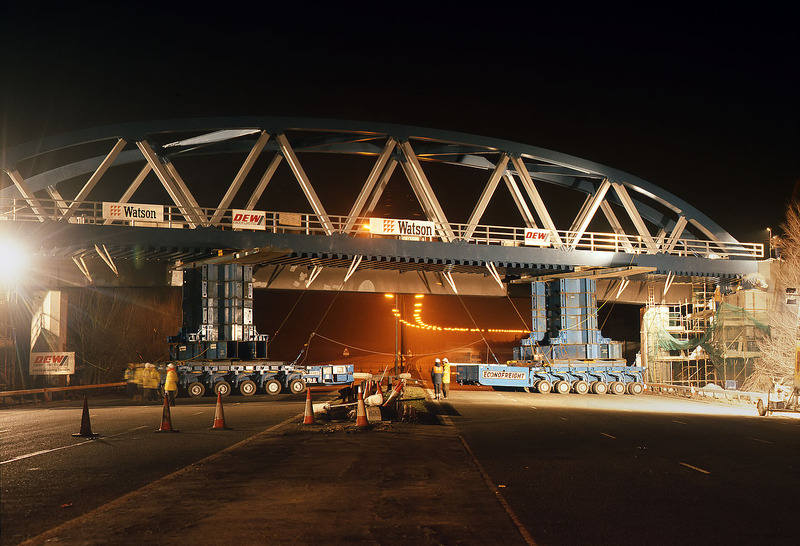 A very strange experience to be standing on a motorway in the middle of the night watching a bridge being moved!